Pet loss and grief can be difficult and heartbreaking for people, but it can be an even greater challenge to help the surviving pets deal with pet loss. Cats do, indeed, grieve. They cannot tell us how they feel. And the owners in the family may overlook behavior changes while dealing with their own sense of loss. Not every pet will react at all, while a percentage seems to suffer greatly. When pets grieve, they usually show their sense of loss with behavior changes. In fact, separation anxiety is one form of grief–your cat only understands someone she loves is gone. The surviving pets often begin to act differently when the cat or dog first becomes sick or starts to decline. For people, this can be a time of preparation, and some of our grieving may be done well in advance of the pet’s actual death. Dr. Barbara Kitchell, a veterinary cancer specialist, says that grief counseling often is part of what caring veterinarians naturally do. We can’t know if surviving pets realize their companion animal friends will soon die, but they certainly do act as though aware a change has–or will–occur. In fact, many sensitive cats (and dogs) react to their owners’ emotional upset and grieve in response to our own changes of behavior over the heartache. The surviving pet may seem withdrawn and depressed. Often the personality changes and a shy cat could become more demanding of attention, while a demanding cat instead hides. One of the most heartbreaking situations occurs when the surviving pet cries and looks everywhere for the missing loved one. I have known of cases where this futile, heartbreaking search went on for weeks. Although it sounds macabre, sometimes it can be helpful to allow the surviving pet to say “goodbye” to the body after a furry friend has died. They may sniff and examine the body, cry or ignore it all together–and any reaction should be considered normal. That’s the only way we can explain to them what has happened to their friend, and why a beloved cat- or dog-friend has disappeared from their life. Viewing the friend’s body allows them to understand he’s not coming back. They still grieve, but aren’t driven to look for their missing buddy. People go through several stages of grief–denial, anger, bargaining, depression, acceptance–but not necessarily in this order. While anthropomorphic to think pets might “bargain” (I’ll let you have my catnip toy if only you come back!) it’s certainly within the realm of possibility that they might feel anger or depression over the loss. Pets do in fact seem to finally work through the situation to acceptance–it takes some pets much longer than others just as people get over a loss in different time frames. Many of the same things we do for each other can help our pets. Dr. Wallace Sife, a psychologist and author of “The Loss of a Pet” says to allow the grieving and even validate it with each other by simply offering compassion and support. How do you help your pets manage grief? Simply being with them for extra one-on-one time can help. Talk to them. Try to be positive around your grieving pets. They may not understand the words but will pick up on your emotions. Simply say, I’m sad, and I feel awful, but it’s not your fault–and I know you feel awful, too. You’ll want to avoid babying, though, because that can reward the pet for acting depressed. Play music, particularly uplifting, faster tempos to lift depression. Harp music can have a soothing effect. But any music that your pet associates with positive times could be helpful. An herbal remedy also helps a percentage of pets. The Bach Flower remedy called Star of Bethlehem is said to be particularly helpful for relieving sorrow and grief. You can find Bach remedies at many health food stores, or online. Also, the herb Saint-John’s-Wort acts as a natural antidepressant but must be dosed according to a veterinarian’s advice. If the depression doesn’t lift and lasts too long, your veterinarian may be able to prescribe an antidepressant drug. 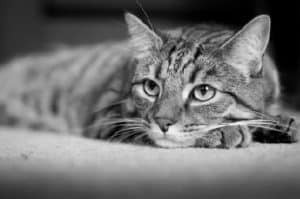 The grieving cat is heart wrenching to watch but you can give your cat sympathy and extra loving care to ease the sadness. You watched your cats nap together, play together, wash each other’s faces and even have the occasional fight. Although you delighted in their close bond, you also get a twinge of sadness knowing that one of these two feline best buddies is bound to pass away before the other one. While you deal with the loss of a beloved pet yourself…you can’t forget that the surviving cat is a grieving cat. The tears stream down my face as I remember the plaintive howling in the middle of the night as one of my cats expressed its grief over the loss of a buddy. I know that my two torties that are litter-mates and best buddies will also deal with a loss they don’t understand. From experience, I know that one cat will not simply go on as if nothing has happened. It is best to be prepared so that when the upset comes, you can help the survivor adjust. For years, philosophers and scientists have debated whether animals feel grief and other emotions. Most people who live with cats recognize they have emotions. Cat owners can attest that felines possess a wide range of emotions, including: the rusty-gate purr of happiness; a lashing tail showing annoyance; and the sudden grooming hiding embarrassment. It should be no surprise that some cats seem grief-stricken after the death of a feline or human companion. Of course it’s hard to know what cats think death means. Cats probably don’t understand death. After all, many terminally ill pets and people die outside the home in a medical facility. A cat knows only that its companion has disappeared. So whether cats understand what has happened or not, they know that things have changed and there is a void. Also, an owner’s depression over the loss of a beloved pet may add to a cat’s confusion and and distress. A grieving cat will show all the signs of depression that you would expect in a person. They don’t just stop eating… they also have sleep disturbances and a lack of interest in things… they may just sit and stare. There are no large studies of a grieving cat but a small survey of 160 households in which a pet had died, conducted by the ASPCA, found on average, cats ate less, slept more, and become more vocal after the death of a cat companion. Survivor cats also tended to become less confident, demand more attention, and spend more time in spots once favored by their deceased companion. However, reactions were far from universal. About 11 percent of cats ate more, 16 percent slept less, and 20 percent grew quieter. As the different survey responses suggest, not every cat that loses a feline housemate will grieve.Some owners get upset because they come home after the trauma of losing one of their cats, and they find the cat at home is just the happiest cat in the world because it has the whole place to itself. So, there is really no way to predict which cats will grieve. When cats are closely bonded, they are probably more likely to become upset if one dies. But even cats that frequently quarrel may lament the loss of their feuding partner. As with people, some animals seem to have an inherited predisposition for depression and grief. When one of your cat’s companions dies or disappears, be alert to changes in your cat’s eating habits. A cat that goes off its food is at risk for hepatic lipidosis… a potentially deadly liver disease. Grief-induced anorexia (lack of appetite) is not uncommon. If your cat cuts down on her food intake, you must encourage her to eat. But don’t change diets in an attempt to titilate her taste buds. A new food may upset your cat’s digestion. Instead, try spending more time with your feline friend. Sometimes an owner’s presence and encouraging words will motivate a reluctant eater. Also, warm the food slightly and add a little water or meat juice. Beyond just encouraging your cat to eat, you should try to engage her in pleasurable activities such as petting and play. Granted, you may not feel much like playing because of your own grief in losing a pet, but doing so may help both you and your grieving cat to come to terms with the loss. Also, stick to a routine. Don’t make too many changes or alterations to schedules. It is also recommended that you don’t get another cat right away. A new cat may take your cat’s mind off her missing companion, but the newcomer will also be source of stress. Stress is something your grieving cat can do without…and most owners need time before they feel ready to adopt another cat. If your cat continues to act depressed for weeks or stops eating for more than 3 days, consult your veterinarian. Your pet may benefit from treatment with antidepressant drugs, or she may need to be force fed to restore her appetite. In most cases such intervention isn’t needed. According to the ASPCA survey, almost all pets that lost a companion were behaving normally within 1 to 6 months. The loss diminishes over time.